World Champion Viswanathan Anand's hunt for the elusive victory continued as he played out fifth draw on the trot, signing peace with Magnus Carlsen of Norway in the fifth round of 5th Final Masters, here. Yet another draw, coming with white pieces, did not serve Anand's cause in any way as the lead positions remained unchanged after the end of the Sao Paulo leg of the super tournament. The event will now shift to Bilbao in Spain after a week's break and the players are expected to work harder when the Battle Royale commences. As things stand, Caruana continued with his four points lead under the soccer-like scoring system that gives three points for a win and one for a draw. After five games, the Italian stands firmly in front with two draws and three wins and has an envious 11 points. With Carlsen on six points and Anand on five, the tournament is only simmering up and much will be known only after the matches resume a week from now. For the records, Karjakin and Vallejo Pons share the last spot with three points apiece. 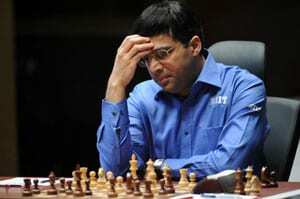 For Anand, the Sao Paulo part of the Final Masters simply did not work at all. The Indian ace faced the Queen's Indian defense as white against Carlsen and again got very little out of the opening. As the game progressed, Carlsen liquidated to an endgame with mutual chances but once a few pawns got traded the complications ended in quick time. The players arrived at a minor piece endgame and exchanged at will to reach a bare king's position in 58 moves. Aronian had Caruana in a vice like grip and one could only wonder as to what went wrong with the Armenian stalwart. Playing the white side of an English opening, Aronian had everything in his favour once the complications of the middle game ended. White's forces controlled the centre, black had little counter-play and the pieces were co0rdinating well. Caruana, to his credit hung in with some precise defense, refusing to crack up and this was when Aronian failed to spot the best moves with the clock ticking away. Giving back the exchange, Aronian went for an endgame with two extra pawns but much to his dismay found that the win had become very difficult. After a couple of more inaccurate maneouvres, Caruana neutralized the advantage and the game was drawn after 74 moves. In the other game of the day, Francisco Vallejo Pons played it safe after Karjakin sacrificed a pawn out of a closed Ruy Lopez. The players reached a level rook and pawns endgame that was drawn in 55 moves.